The common thread that runs throughout the entire COSEE Network is collaborations. 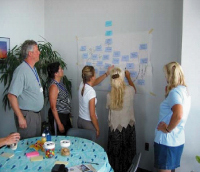 The COSEE Network encourages, develops and maintains collaborations between ocean scientists and a range of communities, all focused on the outcome of enhanced ocean literacy. These collaborations are developed as models which may then be replicated throughout the Network and beyond. COSEE has published a Guide for Scientists that provides basic information for scientists who wish to engage in education and public outreach (EPO).